I thought Freedom was complete last night. I brought her downstairs and put her on the mantle. She wasn't finished. I've spent all morning and half the afternoon on details. They all want details. :o) For some reason I find her so different than the rest. Perhaps because she looks so young to me. She did say that Freedom was a fairly new concept in the world - so she was in fact young. Also told me I take Freedom for granted as I was born to it. Not everyone is so fortunate. True. It's quite difficult to get a good photograph because of all the gold metallic I use - so I've made you some detail shots below. Since one of the birds was offering her a heart (symbol of love), because they were so happy not to be in a cage. Since 'love was in the air' I couldn't resist putting small hearts in the sky to take the place of stars. It's that 'time inbetween' again. Time when I am restless and I don't know what's coming next. I'll be happy when something surfaces. OMG, Donna, she is stunning! I love love love all the extra detail done.. She sings freedom. Yvonne has the same word I did when seeing this- stunning! Love your color sense, and the details are, well, stunning. It is all in the details Donna. 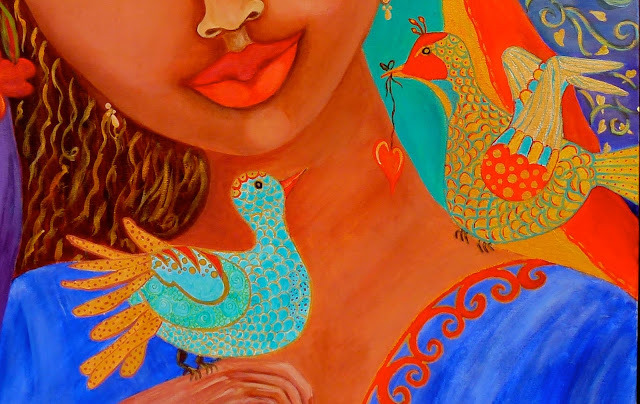 I spy that tiny earring shes wearing and the colorful birds are the perfect finishing touch. This is a beautiful painting.All your extra details added to the perfection. Donna, she is so beautiful. I love the colors and those birds. I am completely in love with your paintings. You have such a gift my dear. I dont want a virtual Sangria I want a real one !!!! on YOUR balcony 1. She is amazing, so serene, beautiful and peaceful, I love the little bird and how he gazes up at her. The little hearts are so pretty.